What was this person counting? Reason: That's a lot of coal! Clearly they were tallying the number of spots on the wall and arranging them by surface area. 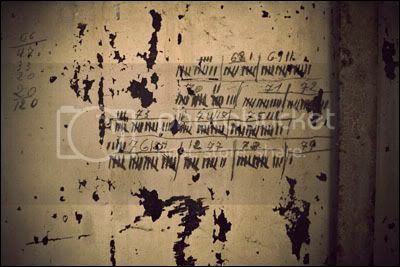 Tracking the number of beers bing consumed during the Frat party. Looks like a Lehman Brothers audit to me. She calls me her ignorant louse. I've spent a lot of nights in this dog house. If it's pay day yet.